An engineer's calliper with a digital readout. A device consisting of a primary scale and a sliding scale, normally the sliding scale has one less divisions than the other. Thereby making it possible to read the primary scale to greater accuracy. The instrument above is a standard vernier gauge or caliper that has hardly changed in over a hundred years. The Vernier is named after it's French inventor Paul Vernier. (1580-1767). It relies on the fact that the eye can only do very vague estimates of how far between two marks on a scale a pointer is, but when two scales are lined up and one of them has say 9 divisions and the other has 10 then the eye can clearly see the point where two of the marks are closest to touching and so get a far greater degree of accuracy. 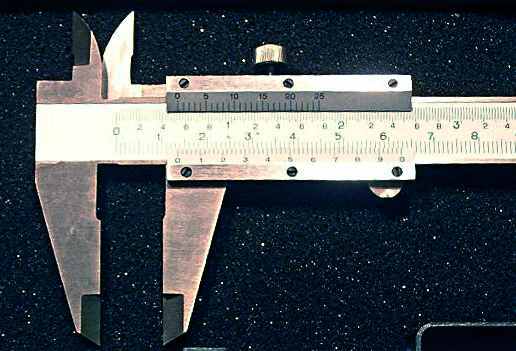 I had a vernier gauge for years and I am by no means an engineer or did engineering work. 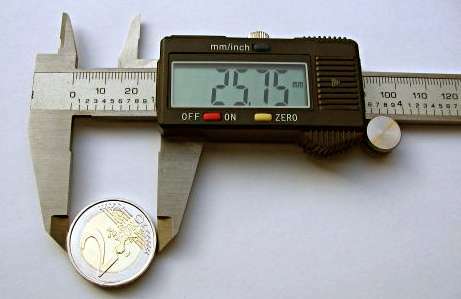 It was just so useful for measuring bolts or other round objects. While the extreme accuracy I didn't need just the fact of getting to the nearest millimetre in many case was just too hard to do without it. Often when taking a sample bolt into a store the guy behind the counter would reach for a vernier gauge to get it right. Many times I have seen them using cheap plastic ones that still do a great job. The main points to be gained from this sketch is the fact that there are three possible measurements that can be made with all of these instruments. 3 - the depth of a hole or the difference between two adjacent faces. All read from the same section of the gauge. The Dial Gauge is an improvement on the simple vernier gauge enabling professionals to make fast and east readings every time. Once again an instrument that is easier to use and gives a greater degree of accuracy that other methods. Provided it is kept in good working order.